Where are the deserts in the Southwest and Mexico? The areas located here on this map are controversial to say the least. Everyone has a different idea of where these deserts are and where their boundaries are located, even the professionals. So here's what was decided were the best locations for each of the four main deserts in the Southwest. Some of these area are also considered High Desert -- see below. 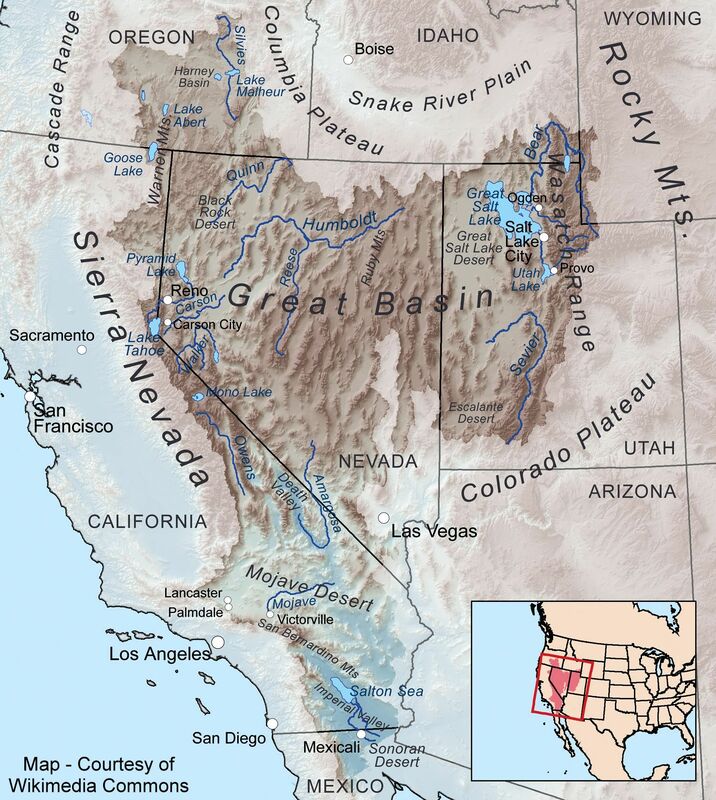 The Great Basin, the northernmost American desert, covers most of Nevada, a large part of Utah, a small part of California and even some of Oregon. Most of this desert is high and often cold; large sections receive most of the annual precipitation in the form of winter snow. The Great Basin is dominated by a few shrubs that often form vast stands: several species of sagebrush, Shadscale, Blackbrush, and others. These plants are unappetizing to most herbivores, and they offer relatively little shelter, so animal diversity is fairly low here. But some species have come to make a living on sagebrush; indeed, some depend on it almost entirely. Both the Sage Grouse and the Pygmy Rabbit rely on sage buds and leaves for much of their diet. This is also home to Antelope, deer, Elk and quite a few reptiles. A high midcontinental plateau, the Chihuahuan Desert extends from southeastern Arizona and southern New Mexico through west Texas into Mexico; at it's fringes it often merges with desert grassland. It receives most of its moisture in the form of summer storms that move inland from the Gulf of Mexico. They nourish low-growing shrubs, such as Creosote Bush and Tarbush, that often fill wide basins; slopes sprout gardens of Ocotillos, agaves, yuccas, and a wide variety of small and often inconspicuous cacti. At Whit Sands National Monument in southern New Mexico, a wide, slowly moving sea of gypsum dunes has resulted in the evolution of specialized plants and animals, including perennials that can survive burial by sand and Lesser Earless Lizards, whose exceptionally pale scales allow them to move about camouflaged on the dunes. The most species-rich of North American deserts, the Sonoran stretches across southern Arizona and California and deep into western Mexico. In the United States its lushest portions can be found in Arizona, where violent summer thunderstorms produce spectacular lightning displays and nourish a wide array of subtropical vegetation. Tall Giant Saguaros, Organ Pipe Cacti, and a variety of other cactus species, along with Desert Ironwood. Velvet Mesquite, and Foothill Paloverde trees, give this desert a great structural diversity. Animals take advantage of that diversity in many ways. Cavities hammered into Giant Saguaros by Gila Woodpeckers and Gilded Flickers, for example, shelter the nests of about a dozen bird species, while paloverde and mesquite seeds are a nutririous food source for animals from beetles to Coyotes. Centered in southern California, Mojave vegetation extends upstream in the depths of the Grand Canyon. This desert includes some of the hottest and driest places on the continent. Some of its expanses are sparse indeed, dotted with wildly spaced and extremely drought-tolerant Creosote Bushes. Large yuccas, especially the imposing Joshua Tree, are important to wildlife. After fall and winter rains, poppies, phacelias, globe mallows, and many other spring-blooming wildflowers form carpets of color on the desert floor. This map, once enlarged, will give you a better idea of where the Great Basin is and how large it is. Click on the map!